EXCLUSIVE | Qantas will fly its regional Boeing 717 jets between Sydney, Melbourne and Brisbane on weekends starting from early August 2017, in replacing the larger Boeing 737-800 aircraft on selected flights. The move is intended to reduce operating costs and 'right-size' the weekend fleet on these 'triangle' routes, which see much lower passenger numbers outside of peak hours across Saturday and Sunday compared to weekdays. 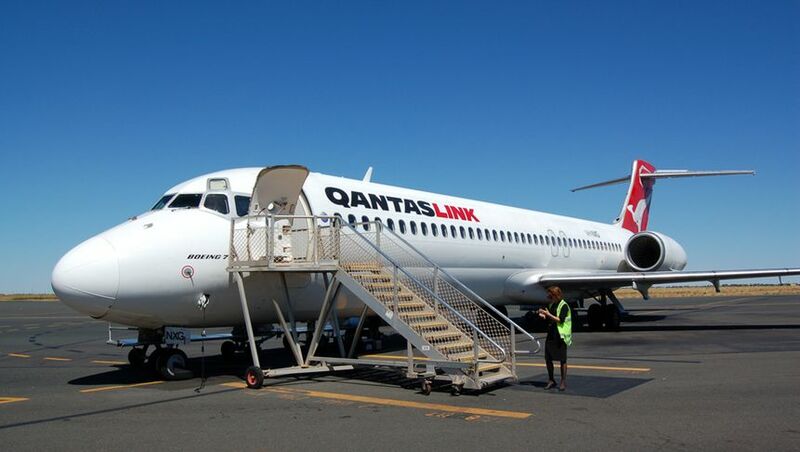 A Qantas spokesperson confirmed to Australian Business Traveller that "about 20 weekend flights in non-peak times" would progressively switch to the Boeing 717s of regional arm QantasLink starting Saturday August 5. "Our strategy is to make sure we have the right aircraft on the right route. It’s a small change that impacts about 1% of our total weekend flying between Sydney, Melbourne and Brisbane, but it shows our ability to adjust to meet the market and still maintain the same number of services." Australian Business Traveller understands that eight flights or 'sectors' will be scheduled from August 5 with the remaining 12 sectors downgraded to the Boeing 717 from mid-August. ... with the airline's Q Streaming WiFi system serving up inflight music and video content. The QantasLink fleet also includes some Boeing 717s in an all-economy layout of 125 seats, but these will remain on regional routes where there's less demand for business class. 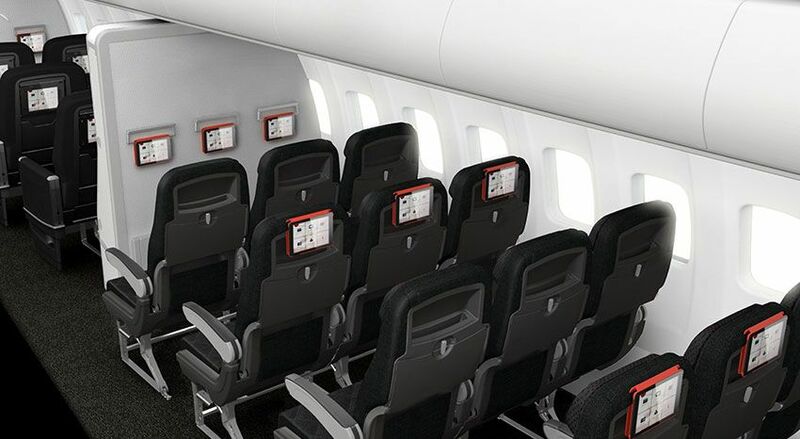 There'll be no impact on availability of business class for those downsized triangle flights, as both the Boeing 717 and Boeing 737 each have 12 seats at the pointy end – although while legroom remains the same, the Boeing 717 seats are slightly narrower at 20 inches compared to 22 inches. Economy class flyers may even prefer the smaller Boeing 717, where the cheap seats are wider (18 inches) and have more legroom due to greater pitch (31 inches) compared to the 17.2 inch width and 30 inch pitch of the Boeing 737 – as well as a 2-3 seating layout compared to the larger Boeing 737's 3-3 configuration. One has to ask why QF haven't done this earlier, in order to save costs and "right-size" their fleet. It was hardly a complex decision for them to make. You're right, but probably due to other competing or more pressing priorities i would suggest. I guess it is probably 'cheaper' to park a 717 on the ground than a 737. Would be interesting to see how qantas intends to utilise the extra capacity freed up by this re-config. so what are the 738's displaced going to do at these times on Sat/Sun? Because those few 738s being replaced by 717s are now needed elsewhere in QF domestic network such as...dare I say, MEL/BNE-PER? cos the economy is heading for the toilet. Property & retail are stuffed. Airlines can't give away seats long haul. Only yesterday, got an email from Scoot to say PERTH/ATHENS AUD$339 + FEW BUCKS FOR BAG & FOOD. Totally agree!! Finally someone who sees where the global economy is going. Private, business and government sectors are all running on tick - and the axe is about to fall, hard. Airlines are already gearing up for the collapse with smaller aircraft fleets and airframe types to cater for the 50% plus possible fall in passenger loads in the next 5 - 10 yrs. could some of the 738's be used to break the virtual VA/NZ monopoly on the BNE/ZQN route ? VA/NZ have up to a dozen or so services a week & operate year round. QF have 2 a week for only about 10 weeks a year. Just looked at flying in August (15-20) & fare was over $1200 in economy return, while I could fly to LAX return in economy for less. I think you'll find food and baggage on the Athens flights add more than $200 each way. This means a return fare with food and baggage comes to over $1040 (on sale), which is around the same you can find sale fares on full service carriers. Long haul low cost flights can often be a game of smoke and mirrors! Actually, those $339 fares included food and baggage. They were FLYBAGEAT tickets. Unfortunately they were not, although it did look that way on the advertisements. The base sale fare was $339 and there was a promo code for a certain amount of flybageat too. thing with LCC's ... you don't have to buy all the add ons. Many people can travel lightly, but don't when you give them 20-23kgs. Have gone to USA with 7 kgs only. Easy to do. The 2 class 717 are great to fly in. However, its really annoying when you think you are going to get nice 717 but then you get the single class "bus". This seems to happen quite a bit due to the maintenance requirements of these birds. I think Qantas needs to consider refurbishing the other 717s; at a very bare minimum Q streaming. I agree, it's one of the best craft in their fleet and its so underrated. That said, I don't mind the "bus" config either, much better than the Q400s they now use on the ROK-BNE route instead. QF is evolving and adjusting its aircraft (pax seating) to better fit demand during certain periods, weekends.AND QF also is great at up gauging domestic routes/flights during periods of high demand. VA is turning into a sole 737 domestic operator. No competition for QF. don't forget VA are using Alliance F70 & F100's. I think Alliance have access to all the Austrian Fokker fleet. Thinking out side the box, surely a few Alliance jets could be configured with some business class seats up front & then VA could do the same as QF, use another airlines aircraft to fly the golden triangle when demand not there, but want to maintain frequency. All staff sign a contract, and have EBAs relevant to their position. If they don't like it, they can raise their concerns to their position. I don't work for them. Thank god. Have a great day. Under The Radar: Messages in ALL CAPS are unnecessary, and as per our comment policy, please keep discussion to the topic of the article rather than the users engaging in that discussion. Your post has been edited to reflect this. Alxarora is well within their rights to express their opinion on matters relevant to that topic, just as you're welcome to express your own opinions in return in a constructive way - but directing users to take their discussion elsewhere isn't acceptable, regardless of whether you agree or disagree with their views. 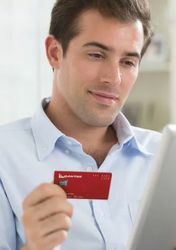 Undertheradar: You have been reminded of our comment policy multiple times on this site and those reminders need not continue. As a result of your decision to repeatedly disregard both that policy and the reminders given to you by the admin team, your commenting privileges have been suspended until Tuesday June 13 2017, during which time your account may appear as 'banned'. We have also deleted your additional comment from this thread which contained personal attacks and was deliberately in ALL CAPS after our prior request. We're sure you can understand why this behavour is unacceptable, and we look forward to your return next week. Update: Following on from your private email, we've gone ahead and made that ban permanent. Bringing the most unreliable type in the fleet to the triangle route. Interesting. This is probably just an example of how sluggish domestic travel currently is. Both VA and QF have excess capacity throughout their domestic fleets. Both are moving some A330s onto international services to improve utilisation. VA has deferred when it will take its 737MAX8s and is reducing its narrowbody fleet by replacing Tiger A320s with ex-mainline 737s. It is also removing its E190s and half its ATRs and shifting some of these predominantly regional flights over to Alliance. QF will probably park some 737s over the weekends. The wet-leased 717s operated by Cobham are cheaper from an operating and crew perspective. There probably isn't short-haul int'l services to shift them onto. Bali is within reach but it's already over-serviced and JQ can probably do it a whole lot cheaper anyway. VA's order of 737MAX aircraft is more to do with not having money for capital expenditure than capacity reduction. Better utilisation of their jets should mean little impact to their capacity (and Alliance is picking up a lot of the slack for TT). It makes sense for QF as their A330s are now busy expanding into Asia/Trans Tasman and 737s are needed in more places throughout the domestic network. The 717 move is clever because while it is reducing capacity on each flight, it means that QF can still offer the frequencies we've come to expect/demand on the triangle route. The failure rate of these is quite high, cancelled services on the 717 far greater than other aircraft, TSV-BNE is a regular no show. Second is they tend to park the 717 away from the airbridges and a tarmac walk is a regular feature, we have family who can't use the stairs and find the folklift experience overwhelming so we fly them VA now if a 717 service is scheduled. 717s are difficult to maintain not because of its design...it's actually built very robust(a legacy fm Douglas) and by today's std, lacks maintenance-intensive hi-tech avionics & softwares. It's difficult to keep dispatch rate because extremely few 717 operators still exist(Only 5 worldwide and QFLink is the only 1 in Asia-Pcf) resulting in a tiny maintenance+parts support network especially outside the U.S....e.g. HA's 717 fleet size is equal to QFLink but has no problem keeping reasonable 717 dispatch rate. surely on a route such as BNE/SYD or SYD/MEL where there are QF flights every 30-60 mins, those not wishing to fly on a 717 can simply move their preferred departure time 30 mins either way ? QF already fly 717s PER-ADL so not that big a change. By the same logic, even more reasons for the cockpit+cabin crew operating Q400 turboprops to earn the same pay+perks as those operating 717s(They certainly are not) because both crews work for the same employer? BOTH Q400 and 717 fleets of Cobham already serving SYD, MEL and BNE under QFLink brand for yrs so their pay differentials can't be due to different routes/cities. In comparison, the QF 737 crew are @ least employed by a different employer. On the other hand, Cobham employees who work on 717 in BNE-SYD-MEL triangle will never be asked to work beyond 2hrs sector but "fellow workers" on QF 737 in the same triangle can be rostered for 5hrs+ transcon duties....that's a totally different ball game in terms of employer demand fm employees. Just to clarify, the Q400 crew do get the same "perks" as their 737 counterparts, although granted the pay scales are much different, as is industry standard. The turboprops are wholly owned by QF, so they get all the same benefits as anyone else in the Qantas group. The 717 crews on the other hand get no such benefits, or protections for that matter. They are employed by cobham and are completely seperate to the Qantas group. Thx for the clarification. Learnt something new fm your explanations. If "They are employed by cobham and are completely seperate to the Qantas group. ", what's the econ justification/rationale for Cobham to copy/replicate employment terms & conditions @ QF Group? In fact to the best of my knowledge, employment terms & conditions vary even within QF Group across wholly owned subsidiaries such as QF vs JQ. If employment terms & conditions are equal between Cobham vs QF, labor cost per head for Cobham will logically be @ least equal to QF(or even higher than QF due to Cobham does not enjoy similar staffing econ-of-scale as QF). In such case when op costs become similar, far fewer reasons remain for QF to out-source the QFLink work to Cobham...resulting in less employment opportunities for Cobham employees 1 way or the other. A) More Cobham jobs for more QFLink work but @ lesser pay/benefits than QF. B) Equal pay/benefits as QF but fewer QFLink work sustaining fewer jobs @ Cobham. The hypothetical scenario C) where QF outsource more QFLink work to support more Cobham jobs @ equal pay/benefits(i.e. equal labor cost) as QF exists only in utopian society or socialist econ model(e.g. little or no differentials in wage & welfare for employees across producers/employers). As seems to be usual for QF, another downgrade that potentially will impact their transcon flights, as I believe that the spare 737s will gradually replace the 332s and 333s on the longer hauls to PER. There are a number of leased VA 737-800s that have leases expiring to coincide with the original delivery of the 737max. Those leases will be extended depending on market conditions as they will now be short of aircraft. VA don't exactly have the cash to pay off new aircraft right now. They can't even make a profit at the moment. QF pushed their deliveries back so that it fit into the 2018/2019 financial year. Will there be an impact on number of B717 services from CBR? Very smart move! Hopefully I will get an opportunity to fly on one! Have flown the Biz seats SYD/Maroochydore. Good experience, and love the quietness of engines on the tail. They say that they will have iPads for streaming in the seats but these were removed from Qantas Link flights out of Hobart nearly a year ago. Does this mean they are going to re-add these to their fleets? I like the 717 as I use to go Brisbane-Rocky on it. more comfortable and quieter than a 737 at both ends, the 2 seats are good as well. They've stopped using it to Rocky unfortunately, it's an all turboprop service (unless they've bought them back very recently). Meanwhile, Virgin is replacing their ATRs with 737s out of Rocky, and have had 737 service with IFE and business cabin for a long time now, giving them the edge over Qanta on that route. Thanks Dredgy It was a while back, I worked for Ergon on the retail side which gives you an idea on how long!!! I had my first cancelled Qantas flight on Monday (BNE-ADL). It was due to mechanical issues with the 717. Not sure this is a great idea. The 717 is a great aircraft to fly on. 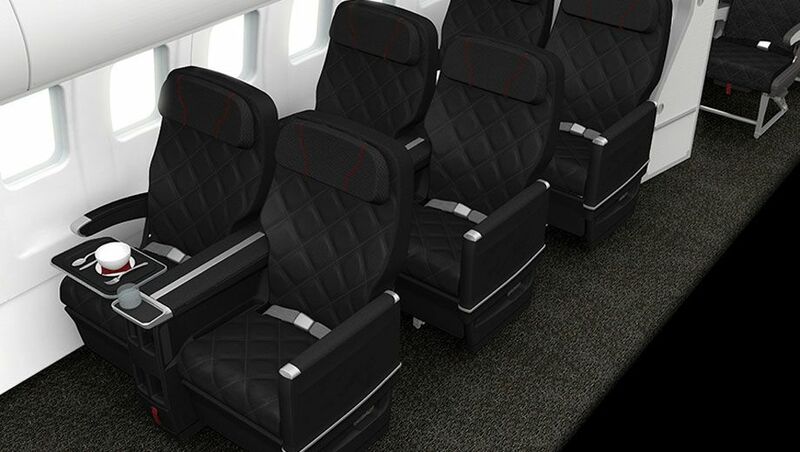 Wider seats than the 737 and 2-3 seating is great when flying with your partner - no centre seat! But, one toilet for 110 people in economy isn't ideal. seat pitch does not equate to legroom. An aircraft with 30 inch seat pitch can have more legroom than an aircraft with 31 inch, if the former has modern seats with thin seat backs & the later has old seats with thick seat backs. Do the QF link 717's have original seats that may have been recovered at some stage ? Really smart move, if there's not sufficient demand for the Boeing 737 then the Boeing 717 is a fair swap and as this article says, could ever be better for some flyers. 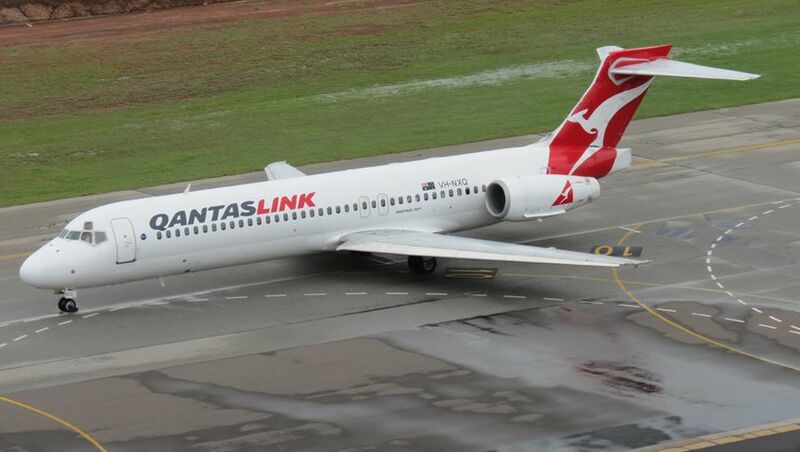 I've flown in the QantasLink Boeing 717 quite a few times and it's a great little aircraft. "if there's not sufficient demand for the Boeing 737 then the Boeing 717 is a fair swap.."
But fm purely consumer perspective, such a move will always be regarded as a down-grade(or even hated or considered as unfair swap @ the extreme) by most....despite technically, it's a down-gauge, not really down-grade. Pax always prefer lower rather than higher load factor in a cabin...who doesn't like more empty seats nex to them for <spreading out> which they don't need to pay for? The airline is the only 1 which hate low load factors and in this era of the relentless pursuit of op efficiency(i.e. constantly cutting fats to please shareholders), will always look for ways to eliminate seat supplies no one want to buy(but everyone onboard still luv to retain) such as down-gauging fm 738 to 717 during off-peak periods. Unless we go beyond the consumer mindset, public comments re type down-gauge on a route will predictably+almost universally negative. most consumers wouldn't know the difference between a 717 & a 737 !!! If they used airbridges even less would notice. Obviously, there will be people complaining when such aircraft swaps do occur. Last year I'd fly TSV-BNE on a Sunday afternoon 737 service and the plane would sometimes be only 30-40% full. When the 737's got subbed for 717's to TSV people complained but then there is always the trade off of BNE getting POM and CHC services as a bonus. That being said it does surprise me as a lot of weekend services on the triangle route are often very full. Last month on Sunday afternoon it took around 30 minutes to clear Sydney Terminal 3 security due to the crowds. Will Qantas drop there prices now ???? Another kick in the balls by Qantas..
Why should they??? The 717 product is no different/worse from that on the 737. In fact, quite a few people prefer the 717. No need to dump any seats cheap as there won't be any seats left to dump. It would be nice to have a Qantas 738 on the Perth - Bali route. A lot of people do not want to fly on budget airlines especially as the starting point of a holiday. I doubt we'll see something like that. There are also many other planes that airlines including Qantas would want to be manufactured again. The Dash 8-200 and 300 comes into mind. Whilst the AN-74 has the range/pax numbers the next regional aircraft Qantas will want to look is something which can land on 1000m strips and the AN-74 needs 2000m. The CSeries is a possible replacement for the 717 when the time comes. I agree, there is - I think - a strong business case for it. It might be a hard sell initially, but I think everyone who's bought it has loved it, and it has incredibly high passenger satisfaction ratings. I'm pretty sure QF would order more, as would many others - it was just a bad time for aviation when the 717 faced the chopping block. I agree, a re engined 717 with split wingtips would be great. Unfortunately, I don't see that happening. 1. All 717 production toolings @ Boeing Long Beach site are either sold or scrapped a long time ago. Worst of all, a large part of its supply chain(e.g. turbofan made by a BMW+RR JV) is gone and would cost Boeing a fortune to resurrect. 2. With only 156 frames ever built across 8yrs, 717 was never a big seller in its era. More 320s or 737s are rolling off production lines every quarter these days than that quantity. 3. 717 competed in a size class very close to the Max7 planned for Boeing production. Hard to imagine Boeing would like to resurrect 717 production to cannibalize the already extremely weak sales for Max7. 5. In a way, 717 is still in production today although not by Boeing and certainly no design patent-related royalties being paid to Boeing. The Chinese ARJ21 is technically a 75-80% copy of the 717(Visually, they are 99% identical). so the B717 are getting realy old, like retro old.......what's the replacement? I love the 717 so hope I can get one. I go out of my way to fly them and QF have done a good job of the refurb. I'm curious though, I've never seen a weekend flight less than full and I don't fly at peak times. And I do it reasonable often. We flew Sydney Hobart return in a 717 in February 2016 and the 2 part of 2-3 seats works really well for a couple. Also flew HNL to Big Island Hawaii in 2014 as a family of 5 and again no issues. Very vague memories of flying an Alitalia DC9 circa 1972. QF love the 717 and snap up any good ones that come on to the market. They are very reliable and cheap to maintain. I don't know how VA is going to cope without the E190s to compete with the 717s. They've already had to drop routes like SYD/MKY and are operating routes like SYD/CFS with 737s that are vastly to big for the route. They need something that is in between the ATR, which is slow and not a patch on the Q400, and the 737.I guess their only answer is to grab all the F100s they can to try to match the 717s but they'd need to reconfigure them with a J cabin. Comment on "Qantas to fly Boeing 717s between Sydney, Melbourne, Brisbane"